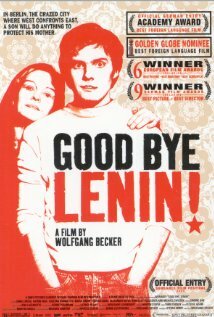 In the 2003 German film “Goodbye Lenin” we see the coming down of the Berlin wall in 1989 through the eyes of Alex, a young East German man. The gist of the story revolves around an incident where his mother has a serious heart attack and is in a coma at the time the wall comes down. She awakens well after the event. But as she isn’t allowed to have any shocks no one tells her about the momentous changes in Germany. The story then explores this dilemma. I have often wondered how a saint, who died in the 1950s, would respond to our Christian lifestyle if they were to return more than 50 years later. How would they react to the television and film content we consume or the magasines and books we allow in our homes? What would they think of our language and priorities? I am prudish enough still to be offended by the crass language now so common in films, and the revealling catalogues that ordinary department stores send out. Photos only found in men’s “girlie” magasines in the 50s now seem quaint in comparison to the magasines I see at the supermarket check out. “Times change,” I am told. “We can’t stop it,” says another. True enough, but it is more the unthinking acquiescence that troubles me. I don’t pretend to have answers but all these small examples are evidence for a far deeper malaise: the depreciation of values and ideals – even, or should I say, especially, in Christian circles. In this passage Paul is reminding his fellow workers that as they pursue and prepare for Christ’s kingdom there is a lifestyle that goes with it. It is a lifestyle that reflects our Saviour and King. We are His ambassadors. As we serve Him even the little things count because they give evidence of what is in our hearts. Too often we forget that one of the most powerful witnesses we have to our neighbours, workmates and friends is the way we live our lives: To use an old hoary phrase: “Walk the talk.” But walking the talk can easily turn into legalism. Really it must be more than that. It is walking the very relationship in Christ that impels our lives. Because of Jesus’ sacrifice for me my passionate desire is to become, in His strength, what He wants me to be. That is my witness – Christ in me. I know that I need to do a constant audit of my heart. What about you?